Be the first to share your favorite memory, photo or story of Agnes. This memorial page is dedicated for family, friends and future generations to celebrate the life of their loved one. 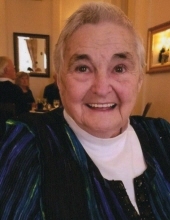 Oriskany Falls-Agnes M. Winn, 80, passed away peacefully with the love and support of her family at her side, on Tuesday, February 5, 2019, at Hamilton’s Community Memorial Hospital. She was born on March 11, 1938, the oldest of six children, the daughter of the late, William G. and Mary M. Radell Hazzard. Until she married Larry A. “Hoss” Winn, on October 7, 1956, Agnes never lived in one place for more than eight years, and one time, only eight weeks. She loved family events; she often went on school trips, and even going on school field trips with her grandchildren. After all the children left home, Agnes and Larry were inseparable. Besides being a devoted farm wife and mother, Agnes had held many positions outside of the farm and home. She held the distinction of being the first female member of the Oriskany Falls Fire Department. Being a NYS EMT, Agnes held first, the rank of Lieutenant, and then was promoted to Captain, of the fire department’s ambulance squad. She had also worked at the former Harding’s Nursing Home and for the Madison County Department of Health, as a nurse’s aide. As a life parishioner of St. Joseph’s Catholic Church, Agnes not only was a Religious Education Teacher, at her home parish, she also had taught at St. Mary’s Catholic Church of Hamilton, and St. Bernard’s Catholic Church of Waterville. She also had held the position of the Town of Augusta Assessor for 24 years. But most of all, her family was “her world,” and she will be deeply missed by all. Agnes is survived by her seven children; James R. Winn, Douglas E. and Lisa Brady Winn, Thomas C. and Diane Evans Winn, Willie K. and Barbara Diehl Winn, Allen L. “Stubby” and Jennifer Georgia Winn, Larry A “Chad” Winn, and her only daughter, Linda L. Winn, her brother and care giver, William G. Hazzard, II; and her sister and brother-in-law, Charlene and Donald Hartmen; 19 grandchildren; 9 great grandchildren; one great-great grandson; numerous nieces and nephews. Agnes is also survived by a special sister in law, Marilyn Hazzard; former daughter in law, Judy Gould; a brother-in-law, Donald “Toots” Winn and a sister in law, Lois Winn. Agnes was predeceased by her parents, Bill and Mary Hazzard; her beloved husband of 61 years, Larry A. “Hoss” Winn, Sr.; her grandson, Nichols M. Winn; her great grandson, Adrien N. Kennedy; her sister Ella Mae Hazzard Talbot; and her brothers Howard H. Hazzard and Robert H. Hazzard. Agnes’ family extend a heartfelt thank you to the members of the Oriskany Falls Fire Department, Oneida County Health Aides, the Doctors, Nurses and Staff members of the Community Memorial Hospital, and especially Agnes’ brother, Bill, for providing love and support as her caregiver. In memory of Agnes, please consider a donation to either the Oriskany Falls Fire Department, 172 Madison Street, Oriskany Falls, N.Y 13425 or St. Joseph’s Catholic Church, 229 Main Street, Oriskany Falls, N.Y. 13425, envelopes will be available at the funeral home. To send flowers or a remembrance gift to the family of Agnes M. Winn, please visit our Tribute Store. "Email Address" would like to share the life celebration of Agnes M. Winn. Click on the "link" to go to share a favorite memory or leave a condolence message for the family.